Now that the weather in Minneapolis, MN is changing and there is an autumn-like chill in the air, residents are spending more time inside entertaining and watching football. Have you thought of finishing your basement to add functional living space and value to your home? 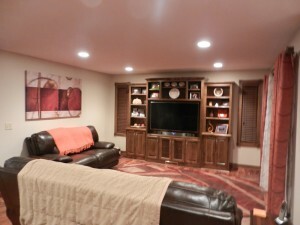 Finding the right Home Remodeling Experts will make a big difference for your basement remodel. Bannochie Builders, Inc. are licensed and experienced contractors who have transformed many unused basements into beautiful and functional, favorite new rooms. Remodeling an unfinished basement is a great way to add living space without adding onto your home. A high quality, lower level renovation also brings great value to your property. The experienced contractors at Bannochie Builders, Inc. will help you to envision the full potential that your basement has. We understand the special difficulties that people encounter when remodeling a basement and are well prepared with great solutions. There are a few things to consider when remodeling an unfinished basement space. Basements are notorious for being cold, damp and dark. We have just the solutions to transform it into a fully functional and inviting living space. With Bannochie Builders, Inc. experience and skills the possibilities for your new basement renovation are endless. There is no reason why your professionally remodeled basement cannot be as livable, inviting and stunning as any other room in your home. Think of what finishing your basement can do for you. Bannochie Builders, Inc. are home remodeling experts who have 25 years of experience with Basement Remodels. We have conquered all of the issues that may come with finishing a basement. Our licensed and experienced contractors will help you to maximize the potential that is hiding in your unfinished basement and transform it into your new favorite room. We are located in the Minneapolis, MN area and are Licensed, Bonded and Insured. This entry was posted	on Friday, September 26th, 2014 at 2:43 pm	and is filed under Home Remodeling. You can follow any responses to this entry through the RSS 2.0 feed. You can leave a response, or trackback from your own site.